Another Story - climb and abseil from Brisbane's biggest bridge. Like any Spider-Man fan worth his Spandex, Celeste Mitchell knows the quickest way to adventurous thrills in Brisbane are found by looking to the structures around you. If my thighs could talk, right now they’d be screaming like a banshee. I’m hovering, perpendicular to a rocky cliff, gripping the rope approximately 10,000 times tighter than I’ve ever held on to anything, when my brain catches up with my body – and it doesn’t get the joke. Why did I think this was a good idea? I’ve seen those buffed rock climbers scrambling up Kangaroo Point cliffs like they’re auditioning for Spider-Man 3. The abseilers, too, seem to be in some private club where dangling from sheer cliff faces is more normal than catching up for coffee. Yet here I am. Feet planted against a cliff-face, my entire body weight (at least in my mind) held only by my superhero grip, ready for Abseiling 101. The reality is: I’m not going anywhere. There’s a hurdle in my mind I need to leap over, because this harness won’t allow one centimetre of a slip without my permission. I’m suited up – helmet, gloves, and serious wedgie-inducing harness – and I’m discovering what vertigo must feel like, 18 metres up. My Riverlife instructor is cooler than a cucumber, reminding me to breathe, and allowing me the time to calm my frazzled nerves. With one small shuffle, then another, I’m soon making my way slowly but surely down the cliff – as well as one can walk while defying gravity. Once I allow myself to take my eyes off the piercing blue sky above, I tilt my head back and see the city skyline. Moreton Island in fast forward – sandboarding. I look right, then left, watching the CityCat ferries glide across the river and the (much saner) people picnicking in the park below. I never look down but, before I know it, I’m stepping onto grass and my head has returned to its rightful position, directly above my feet. For my next daring act, and suitably shot through with adrenalin, I put the Beastie Boys to shame in a dashing onesie, harness and mic, ready for a twilight climb to the top of the Story Bridge. This draws immediate comparisons to the Sydney BridgeClimb, which I’ve done in the past, and I soon find my thinking is not unjustified. Brisbane-born John Bradfield was responsible for both feats of engineering, opening Brisbane’s bridge in 1940, eight years after the famous coathanger. Halfway up, we lose one of the group. The steady climb up Australia’s longest cantilever bridge is too much for her nervous system to take but, for those with a fear of heights, rest assured. You’re attached to a safety line and the guides do an excellent job of distracting climbers with tales of the history of the 75-year-old bridge – one of only three bridge climbs in the world. And once we reach the summit? What a view. Standing at 80 metres above sea level, the sun teases the wispy clouds into a sunset cocktail of pastel oranges and pinks, and the buildings lining the river glow amber as we stop to take in the city from this newfound angle (and let our heartbeats settle). Story Bridge Adventure Climb is the only place in the world where you can climb and abseil down the side of one of the bridge’s pylons. However, with my Cliffhanger morning behind me, I’m happy to take the stairs this time. 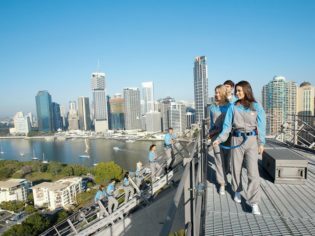 If you’re ready to hit the heights, literally, these activities in Brisbane span the length of the adrenalin Richter scale. Paddle & Prawn: Stick to soft adventure with Riverlife’s Friday night Paddle & Prawns, for a twilight kayak to South Bank and back, plus a bucket of prawns and cold beer for your efforts.